Decent icons/skill for cost even if it isn't day. 2 good subtypes. 2 useful, but conditional, abilities. Odd to see a syndicate card wanting day over night, usually they benefit from both. 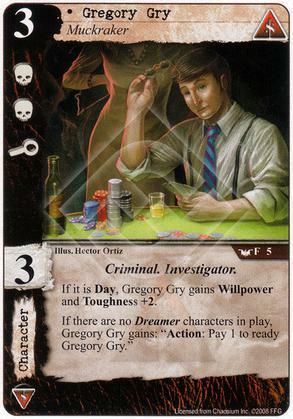 Looks like it fits Syndicate + Agency best, Agency providing Investigator boosts and day cards. With this cycle coming out I think Dreamers may become very common in decks so I wouldn't rely on the readying. Solid 3 cost character with conditional willpower, toughness and standing. Two very supported subtypes. This character will shine in most syndicate + agency/MU decks. Conditional Toughness based on game state can be awkward, but this is still a reasonable character without it. You shouldn't bank on the ability being able to trigger despite it being great, but Dreamer isn't all that common of a subtype, so who knows. Being both a Criminal and an Investigator is just icing. The only downside is that the 3-drop slot is clogged full of superb characters, so finding room for Good Gry Greg in a deck will be tough.